Ranking the Top Center Duos in the NHL - The Point Data-driven hockey storytelling that gets right to the point. Depth down the middle is critical to team success in the NHL and it got us thinking, which team has the best center combo in the league? Looking at last season’s performance, we’ve combined offensive, defensive and transition metrics for each teams top-two centers and ranked them according to their total contribution. Each pair received a total ranking out of 100 based on the categories used and the appropriate weighting of each category commensurate with how much each impacts the outcome of a game. Not surprisingly, offensive contribution is most impactful, followed by transitioning the puck (controlled entries, exits – possession driving plays) then individual defensive impact. 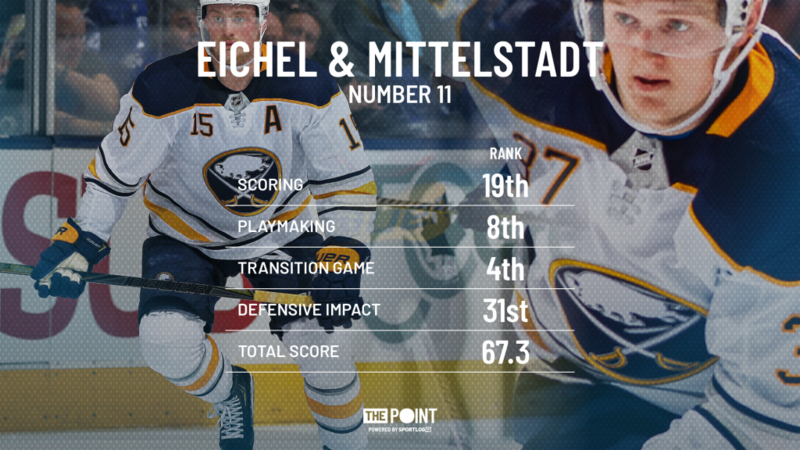 Here is a look at our Top 10 (Top 11 actually, as Jack Eichel and Casey Mittelstadt warranted a write-up based on the potential of this duo breaking out as early as this season) with the full list at the bottom of the article. Wait for it. A potential top-10 duo in the making. Jack Eichel and Casey Mittelstadt are going to be one of the most dynamic duos down the middle in the league and it might happen as early as this season. Eichel is already an elite talent – Mittelstadt has shown all the signs of being an offensive weapon in the 2nd line center slot. Phil Housley will choose who he puts at left wing on each line but the additions of Jeff Skinner and Connor Sheary to the top-6 will be significant for Eichel and Mittelstadt. Skinner is a proven scorer who ranked top-15 in shot generation from the slot last season. Sheary is strong off the puck in the offensive zone, capable of retrieving pucks and disrupting plays with his stick. Eichel is an elite puck carrier, consistently ranking in the top-10 amongst forwards in controlled zone entries and exits. Per game, Eichel ranked 8th and 5th, respectively last season. With Rasmus Dahlin on the blueline, the transition game will be even better, creating more opportunities for quick-strike offense. With an improved supporting cast and pending a healthy season, this may be the season Eichel cracks 80+ points and establishes himself as one of the top point producing centers in the game. There’s only a small NHL sample size to go off with Mittelstadt, who put up 5 points in 6 games last season but he looks like he’s ready for a top-6 role. At a per-20 rate, his underlying numbers (offense generated in the attacking end, loose pucks recovered, passes to the middle of the ice, neutral zone play with the puck) are all strong. What you won’t get from this duo is much away from the puck, as reflected in their defensive impact number listed above. However, the potential for explosive offensive numbers is there and should make for an entertaining season in Buffalo. Eichel and Mittelstadt should have fans on the edge of their seats for years to come. Patrice Bergeron is the best two-way forward in the NHL. Despite missing 18 games last season he was still a Selke Trophy finalist. Offensively, Bergeron averaged nearly a point per game. The Bergeron, David Pastrnak, Brad Marchand line was one of the most dominant in the NHL with all three players ranking top-30 in points per game. Bergeron led all forwards in successful defensive plays per game (10.2) and if he can stay healthy this season, there’s a good chance he’ll be named the NHL’s top defensive forward for the fifth time. David Krejci also missed significant time last season but still managed 44 points in the 64 games he played. 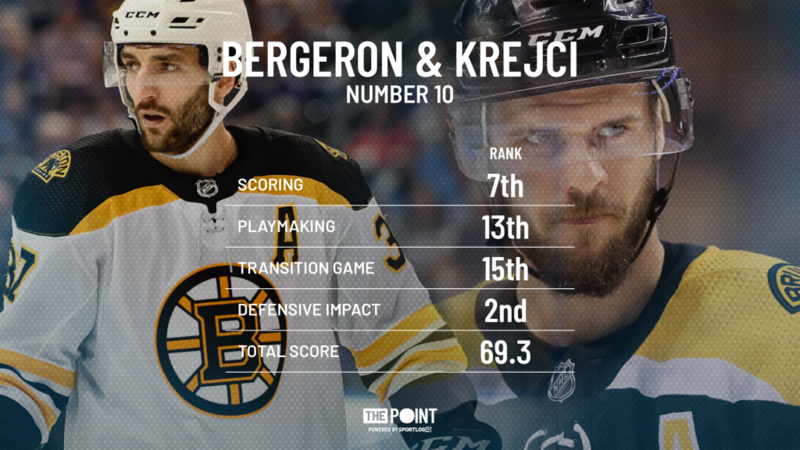 A dynamic presence in the offensive zone, reliable in the neutral zone and active defensively, Krejci is a perfect compliment to Bergeron as 2nd line center. Last season, Krejci completed 14.2 passes per game in the offensive zone (32nd) and of those top-32 players in volume, had the 5th best completion rate (76%). Bergeron and Krejci do a phenomenal job of breaking up plays in the neutral zone, ranking 1st and 8th amongst forwards, respectively in blocked passes between the bluelines. Their ability to disrupt the opponent’s transition game and push the puck back into the attacking end is one reason this pair is consistently on the right side of scoring chances and goal counts. 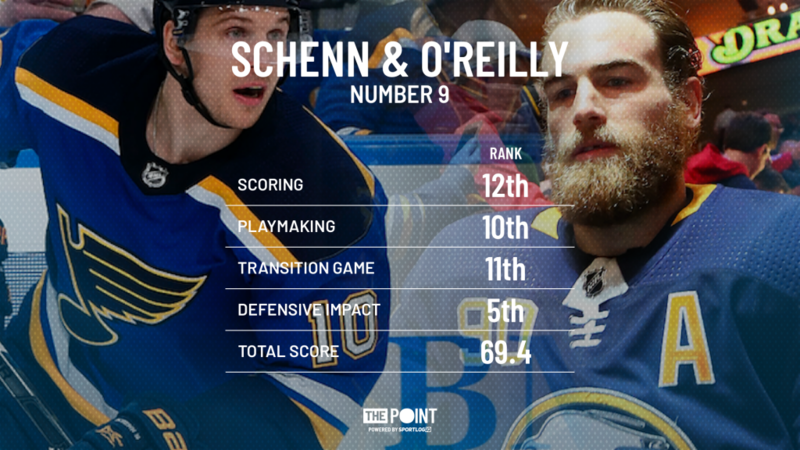 The St. Louis Blues re-vamped their roster and now boast a top-10 threat down the middle in Ryan O’Reilly and Brayden Schenn. Schenn scored 70 points last season while O’Reilly had 61 as the 2nd line center on the lowest scoring team in the league, the Buffalo Sabres. Defensively, O’Reilly ranked 4th in individual impact amongst forwards while Schenn ranked 38th. These are high-event players who get it done at both ends of the ice. O’Reilly is great in the circle and was one of the top playmakers in the game, last season. His ability to handle and move the puck in tight spaces was evident in his exceptional passing metrics. O’Reilly ranked 2nd amongst forwards in pass completion rate in the offensive zone (76.5%) and led all forwards in pass success rate to the slot (58.8%). Penciled in on a line with Alex Steen and Robby Fabbri, O’Reilly should see a bump in assists and points given his playmaking ability. Schenn centered a dynamic 1st line with linemates Vladimir Tarasenko and Jaden Schwartz. In over 400 minutes of even-strength ice together, the unit had an expected goals rate of 62%. Schenn likes to play physical and is tenacious in the offensive zone. The Blues powerplay was a gong show last season finishing 30th overall but with the additions of O’Reilly, Bozak, and Fabbri, who was injured and didn’t play last season, they should be more successful this year. The Central Division has 6 teams who will contend for a playoff spot, sorry Chicago, but don’t be surprised if the Blues go from the outside to a top-3 spot this season. 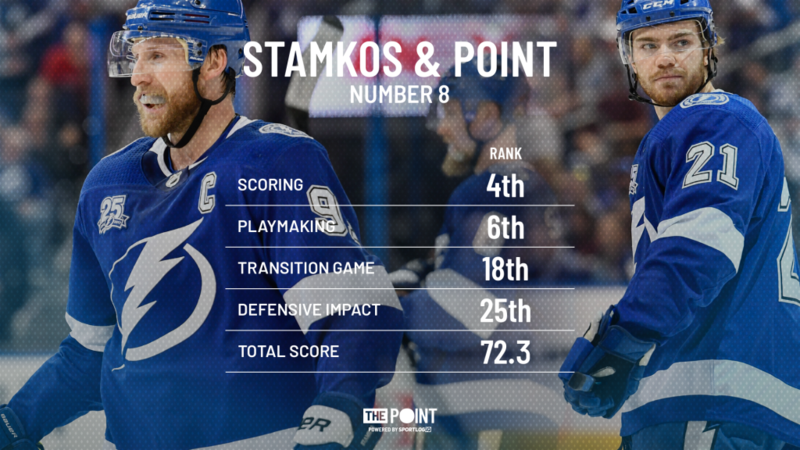 An established star and an emerging one, Steven Stamkos and Brayden Point have valuable, albeit different skill sets. Stamkos can shoot the puck as well as anyone in the league. His 18 one-timer goals last season were the most in the NHL and he’s a weapon from the left circle on the power play. With so much attention paid to his goal-scoring ability, Stamkos likely doesn’t get enough credit for his playmaking ability. Watching Stamkos and Nikita Kucherov play catch from circle to circle on the power play is a thing of beauty. However, Stamkos took a dip goal production at even-strength last season, scoring just 12 times. That production, or lack thereof, ranked 160th overall and was in line with players like Michael Raffl, J.G Pageau and Chris Tierney. Was it a blip on the radar? We’ll find out this season. A case can be made for Point being the Lightning’s most valuable center. He’s their most used forward on the penalty kill, faces the other teams’ top lines and put up impressive numbers at both ends of the ice. Last season, Point scored 24 times at even-strength, tied for 21st overall with Patrik Laine and Kyle Connor and finished with 50 even-strength points, tied for 31st in the league. Entering his 3rd season, Point is already on a short list as one of the most valuable two-way, all-situation forwards in the NHL. Just ask his coach who said he was the best player in the Lightning vs Bruins playoff series that was loaded with star power. 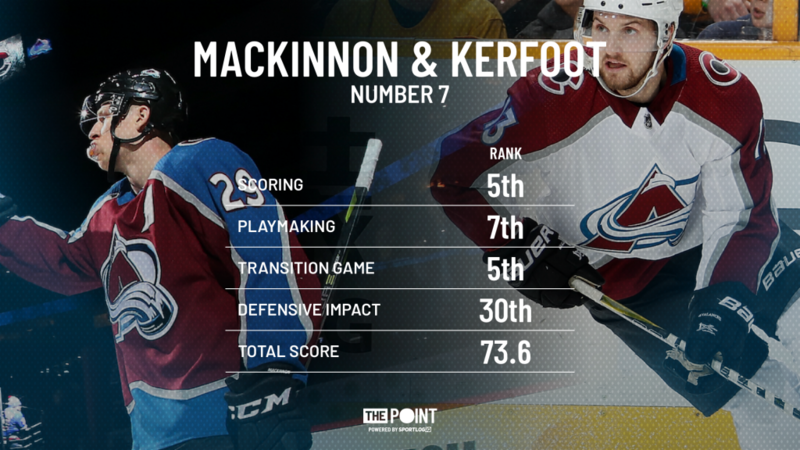 Coming in at number 7, Nathan MacKinnon and Alexander Kerfoot. MacKinnon is fresh off a Hart finalist season, scoring 97 points (5th in the NHL) and almost single-handedly dragging the Avalanche into the playoffs. MacKinnon generated a ton of offense with his speed, finishing 2nd in the league in rush scoring chances to Connor McDavid. How good was he in the playoffs? MacKinnon averaged a point per game and had 15 scoring chances in transition, which ranked 9th in the post-season. Did I mention he only played 6 games? The only players ahead of him played at least 3 rounds. MacKinnon is a dominant offensive force and elite in terms of transitioning the puck into the offensive zone. Kerfoot filled the 2nd line center role for much of the season, though there is talk Tyson Jost may fill the role this season. Kerfoot put up good numbers offensively, posting 43 points in 79 games, including 19 goals. However, Kerfoot’s shooting percentage was more than double league average at 23.4%. It will likely take a significant uptick in shots on goal for him to hit the 20-goal mark this season. With MacKinnon leading the way, no matter who the Avalanche have in the 2nd line center role, they will likely be a top-10 team in term of top center duos for years to come. The Kings boast a 1,2 punch down the middle that can do it all. 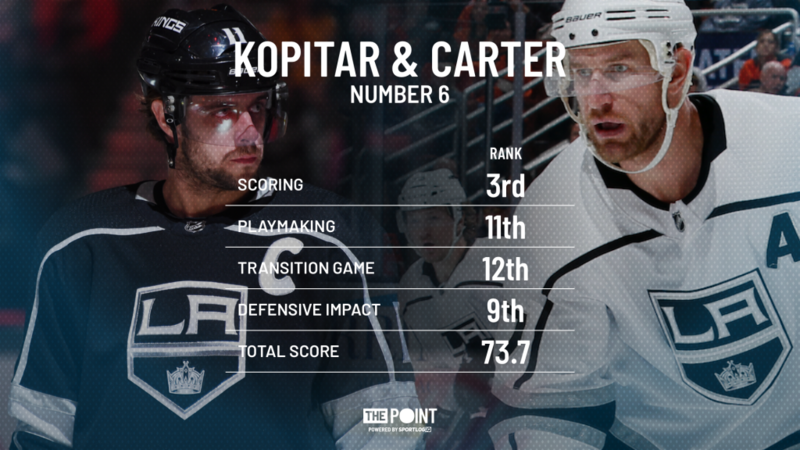 Anze Kopitar is fresh of a Selke-winning season as the league’s top defensive forward. Kopitar ranked 2nd to Alex Barkov, amongst all forwards, in successful defensive plays (752) and was a key piece of the Kings NHL best penalty kill. Oh ya, he also chipped in a bit offensively finishing 7th in scoring with 92 points. No biggie. He’s one of the most complete players in the game, excelling in every facet. Carter missed most of the season with an ankle injury but scored at a high rate in the games he did play. His 13 goals in 27 games was good for a goals-per-game average of 0.47, 14th best amongst players with at least 25 games. In the 112 even-strength minutes the Carter, Tanner Pearson, Tyler Toffoli line played together, they had an expected goals percentage of 55.4%, the best of any Kings line last season (min. 100 minutes). A 30-goal, 60-point season is realistic for Carter and well above average for a 2nd line center. Playmaking, goal-scoring, transitioning the puck, defensive impact – this duo has it all and is an easy choice for a top-10 ranking. Presenting…Stanley Cup Champions, Nicklas Backstrom and Evgeni Kuznetsov. Sounds nice, right Caps fans? Backstrom put up solid regular season numbers, finishing with 71 points in 81 games. One of the best passers of his generation, Backstrom was top-10 completing passes into the highly contested slot area and was one of the most accurate in the league. Of the top-25 players in completed slot passes per game, no one was more accurate than Backstrom who clicked on 53.4% of his attempts. If Backstrom can repeat those kinds of passing numbers next season, expect him to push past the 50 assists he collected last year. Kuznetsov established himself as a star in the league, setting career-highs in goals (27), and points (83). In the playoffs, he led all scorers with 32 points in 24 games. Kuznetsov ranked 14th in assists and top-10 in controlled entries, offensive zone possession and pass completions to the slot, cementing his status as one of the game’s premier playmakers. 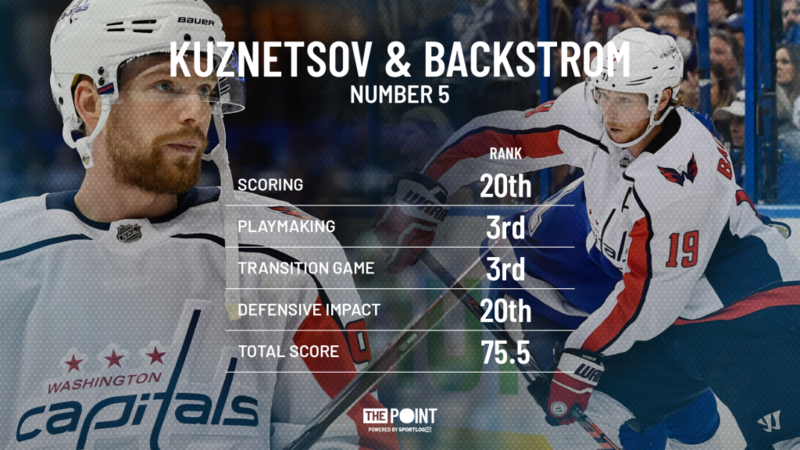 Moreover, Backstrom and Kuznetsov are the only duo on our list to both rank top-10 amongst forwards in puck possession per game – Kuznetsov 7th at 1:43, Backstrom 9th at 1:41. The pair was also lethal on special teams, running a powerplay that scored almost a goal per game in the playoffs, dictating play from the right side of the ice. Watching these left-shots tee up right-shots Alex Ovechkin, T.J. Oshie and John Carlson was a thing of beauty and a major reason why the Capitals won their first Stanley Cup in franchise history. People know Alex Barkov is a star – they may not know he’s a superstar. People know Vincent Trocheck is a solid player – they may not know he’s a star. Ranking 4th on our list is easily the most underappreciated center duo in the NHL. There isn’t a weak link between the two. Both consistently rank top-10 in a number of offensive and defensive categories. The fact that Barkov hasn’t been a Selke Finalist at this point in his career is borderline criminal. Barkov ranked 2nd amongst forwards in defensive plays per game, sandwiched between league leader Patrice Bergeron and Selke winner, Anze Kopitar. Trocheck ranked 10th as the Panthers boasted the only pair of teammates in the top-10. The transition game is another area where this duo excelled last season with both players ranking top-20 in controlled zone entries per game. Once in the attacking end, Barkov and Trocheck created scoring chances for their team at an elite level, 19th and 26th respectively, and between them averaged nearly two points per game (1.9) which ranked 6th amongst our top center duos in the league. 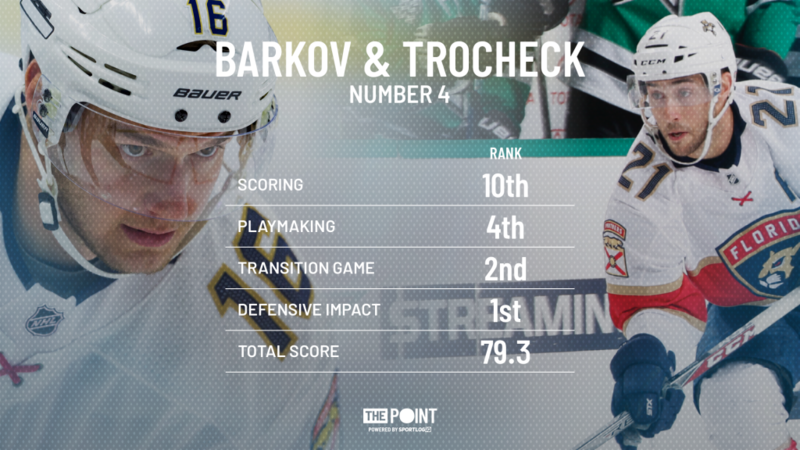 Barkov and Trocheck are the most impactful defensive duo on our list, eat a ton of minutes, play all situations, drive their lines and excel in all facets of the game. When tallying their contributions in all three zones, an argument can be made for Barkov and Trocheck to crack the top-3 – they’re that good. With the addition of Mike Hoffman to the top-6 in Florida this season, expect bigger and better from the Panthers and their top two centers. Maple Leafs fans are jacked to see Auston Matthews and John Tavares down the middle and they should be. Matthews is one of the top goal scorers in the league and impacts the game defensively at a top-10 rate amongst forwards. His awareness away from the puck is matched only by his ability to put the puck in the net. Tavares is a 30-goal, 80+ point player and one of the best at generating quality scoring chances. In fact, Tavares ranked 2nd to Alex Ovechkin in slot shots while Matthews, who missed 20 games last season, ranked 1st in slot shots per game. Not a bad 1-2 punch. 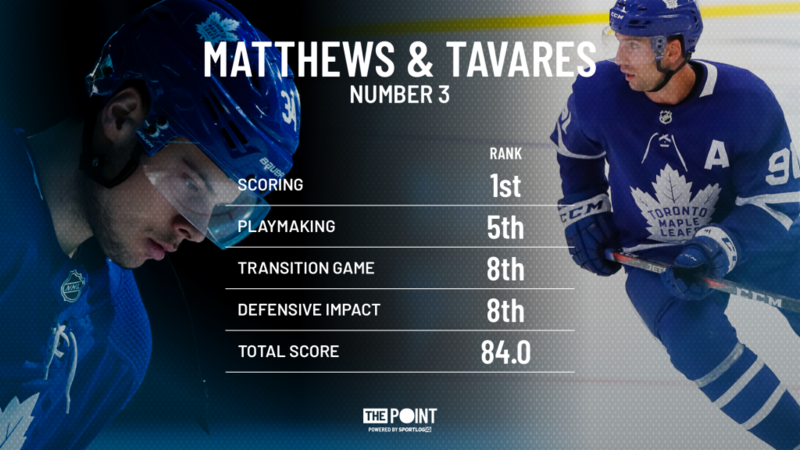 Both Matthews and Tavares are capable puck movers but neither will have to shoulder the load on their respective lines given the shifty right-wingers they’ll be playing with. William Nylander and Mitch Marner like to carry the puck, ranking 1st and 2nd on the Maple Leafs last season in controlled zone exits and entries. While Matthews has proved to be a top forward in defensive impact, ranking 2nd to Patrice Bergeron in even-strength defensive plays made per game, Tavares isn’t nearly as active away from the puck, ranking outside the top 100 (108th). Nitpicking, I know but if you want to find an element of his game that isn’t particularly strong, there it is. It’s entirely possible both players hit career-highs in goals, assists, points or any number of other statistics this season given their ability and the players they will be playing with. If that happens, they could crack the top 2 on this list next season. At number 2 on our list, Sid and Geno. The 1,2 punch down the middle in Pittsburgh has been the best in the league for most of the last decade. 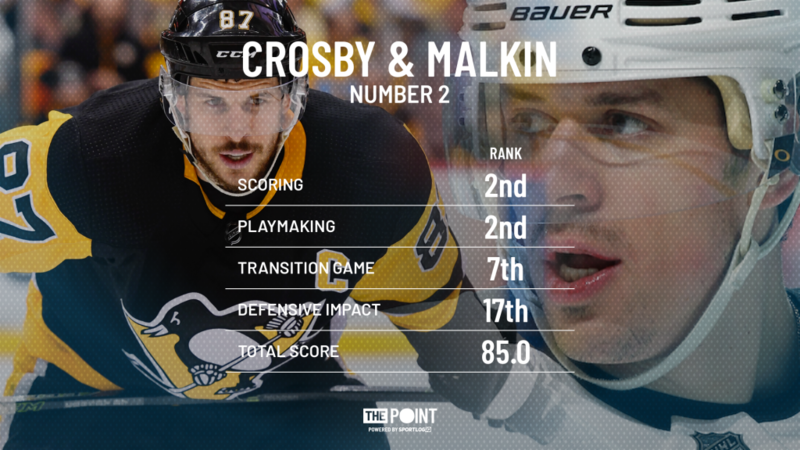 Last season, they were the only center duo to both rank top-10 in points, Malkin’s 98 ranking 4th, Crosby’s 89 ranking 10th. Crosby and Malkin also led the Penguins to their highest powerplay % in team history – pretty impressive considering Jaromir Jagr and Mario Lemieux used to rip it up together. Crosby and Malkin tied for 3rd in powerplay points with 38 each as the Pens paced the league with a 26.2% powerplay success rate. Crosby tied for 7th in assists with 60 and ranked 4th in completed passes to the slot, trailing only Henrik Sedin, Connor McDavid, and Nikita Kucherov. Malkin’s 42 goals were good for 5th in the league as he excelled in just about every offensive metric there is from moving the puck up ice to possessing it in the attacking end, making plays and, as mentioned, putting it in the back of the net. All in all, the pair combined for 2.35 points per game, the most of any duo on our list. 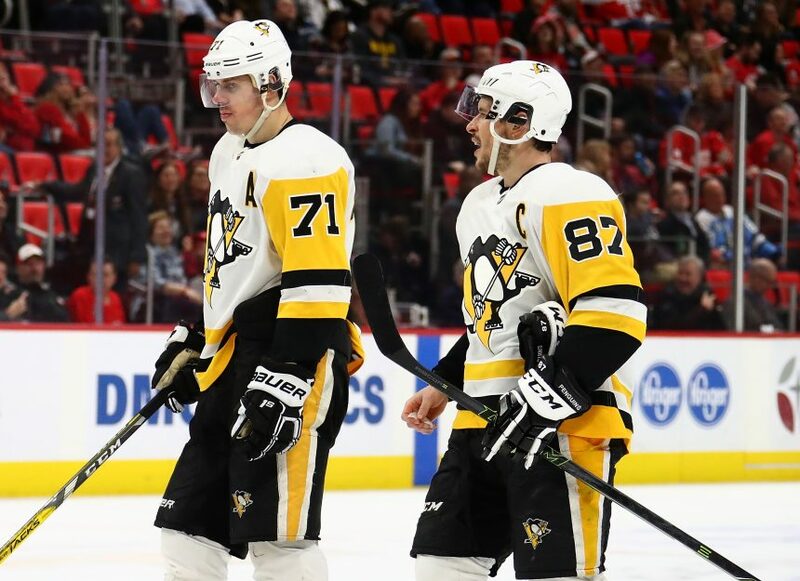 Micro-stats, traditional stats – no matter how you slice it, Crosby and Malkin are both capable of being the best player in the league any given year. Last season wasn’t either player’s best but together, they still rank right near the top of the league on our list. Connor McDavid could drag just about anybody into the top-3 as far as most valuable duos down the middle are concerned but Leon Draisaitl more than carries his weight. Let’s start with McDavid – we all know what he brings to the table. 40+ goals, 3rd in assists, 1st in points and points per game – McDavid is a driver of offense in every way imaginable. Not only did he lead the league in controlled zone entries, his 820 were 131 more than anyone else! McDavid also led the league in completed offensive zone passes, passes to the slot, scoring chances generated for teammates and scoring chances off the rush. As far as individual success is concerned, McDavid is competing with himself at this point. 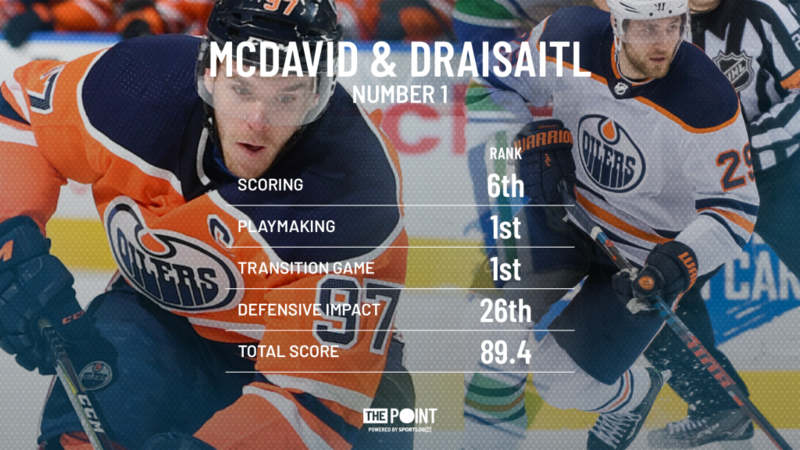 Draisaitl spent time with and without McDavid at different points of the season but if the Oilers want to improve their fortunes they’ll need to have him centering his own line. Draisaitl ranked 16th in controlled entries amongst forwards and 7th in exits, showing he’s perfectly capable of transitioning the puck and driving the bus no matter who he’s playing with. Like McDavid, Draisaitl likes having the puck on his stick and is dynamic when he has it. This duo was the only one our list to average over 3 minutes of combined puck possession per game. With that much possession time, you don’t need to spend much time defending. 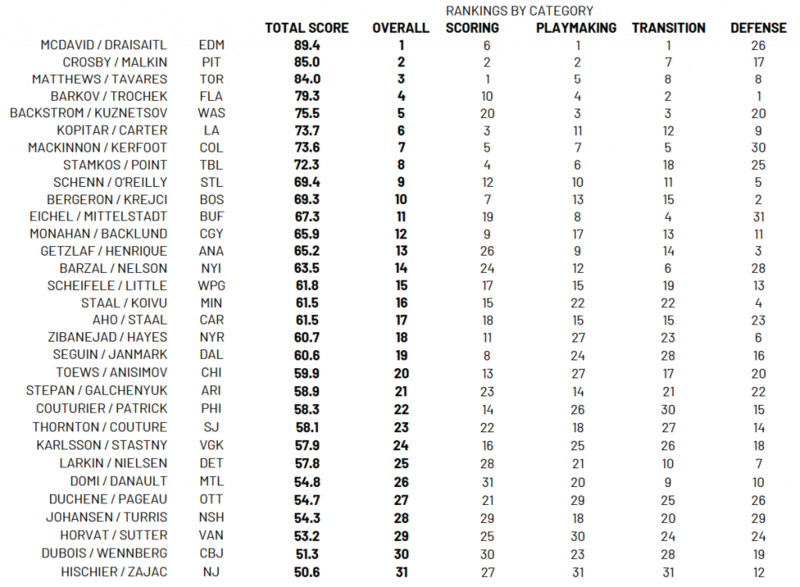 End result, Draisaitl finished top-20 in even-strength points and top-40 in total points. The Oilers have two of the top centers in the world locked-up long-term and both are under the age of 23. They will be consistent contenders for the number 1 spot on this list for years to come.